Originally built in 1942 as a barn, the structure was converted to a two-story house by architect Henry Withey in 1947 for General Harris Malasky, who commanded the Black Hawk Division during World War II. El Encanto is the name of an earlier ranch that was in this area of Northridge. Malasky referred to his property as Black Hawk Ranch. The board n’ batten structure retains its original barn exterior, including the hayloft winch (pictured). It is located on a one acre plot complete with a smaller barn and chicken coop, which is still active. 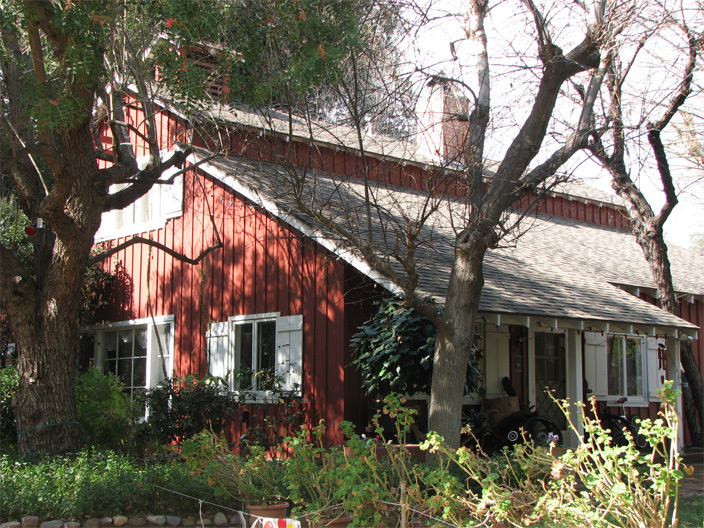 The original farm house, which was on an adjoining parcel, was torn down in 2003 for an apartment complex.